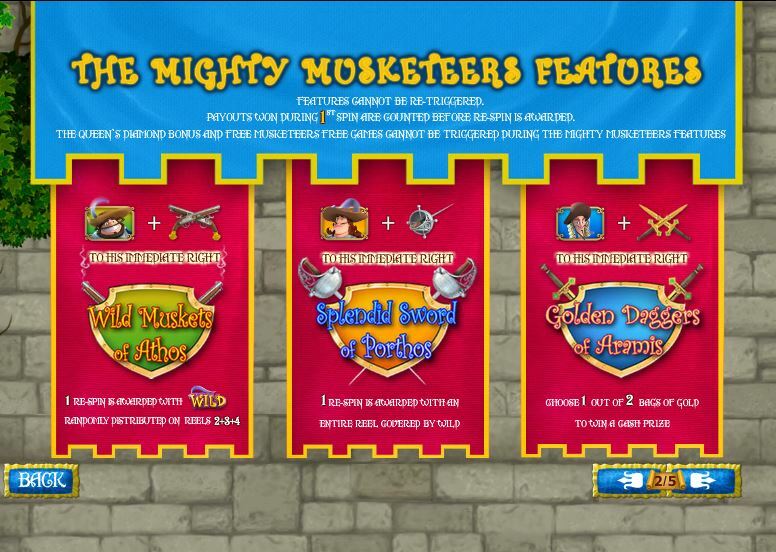 A name like The Three Musketeers should need no introduction, this Playtech slot machine being themed around one of the most popular novels written by Alexandre Dumas. It was a historical novel, which followed the exploits of d’Artagnan and his three musketeer friends, with the action taking place during the 17th century. You will find that this is a gorgeous game, with lots of cool features, a perfect choice for someone that has read the adventures of the musketeers when he was young. As many as 50 active win lines may be used by The Three Musketeers, a game with 5 reels. There are very interesting symbols and features in it as well, like the stacked wilds, the free games, scatter symbols and multiple bonus games. A $25,000 top prize is advertised. 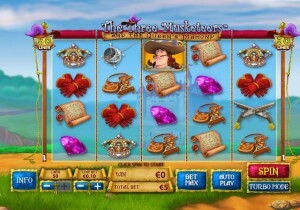 Among the slot’s features you will discover a stacked wild, a stacked scatter symbol, multiple regular scatters and four different bonus games, each of the four main characters having its own to offer. A couple of stacked symbols are used, one of them being the Wild. It is represented by a Wild Logo with a feather on its cap and it is reserved for the middle three reels. Being a stacked symbol on those reels, it can cover only one symbol, or it can cover two or three. It’s not going to be the kind of symbol that gives you a prize, but it will be able to substitute for regular icons. The five scatter symbols of the slot don’t benefit from the wild’s presence though. The 3 Free Games Logo is a scatter which appears stacked, an unusual way of making an appearance for a symbol of this type. It can only appear on the 1st and 5th reels. Both reels need this symbol to be present in order for the spins to start. Each scatter that contributes brings with it 3 spins. Between 6 and 24 free spins can be won. The scatter symbol appears on all the reels while the free spins are used up and each time you get one you receive an additional 3 spins for free. The symbols with the three musketeers act as scatters and they can offer prizes when they make an appearance in two (2x the bet) or three positions (7x the bet). They also trigger bonus games when they have a certain type of weapon to their immediate right. Porthos is going to appear on the 2nd, 3rd and 5th reels. When a sword appears to its immediate right, this scatter can trigger the bonus feature called Splendid Sword of Porthos. Athos is next, another scatter symbol, which is reserved for the 1st, 2nd and 5th reels. Having the symbol with the two muskets to his right will trigger the feature Wild Muskets of Athos. 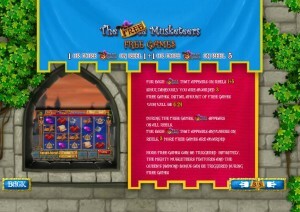 Aramis gives you access to the Golden Daggers of Aramis bonus game, whenever the Daggers symbol is to its right. Aramis is reserved for the 3rd, 4th and 5th reels. Finally, we have d’Artagnan, another scatter symbol which can trigger a bonus game. It’s a symbol which is used on the reels 2 and 4. 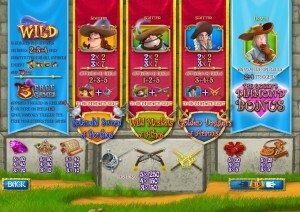 Two d’Artagnan scatters need to be on the two reels, in order for the bonus game to start. At the start of the bonus game, you have two lives. As you advance, you can win more lives and gold coins (which give you 1x the bet). During your search for the Queen’s diamond you will have to advance through 5 levels. During each level, you pick one of the three choices available to you. Correct choices allow you to advance and you get a prize. Incorrect choices eat up one of your lives. For as long as you still have lives, you can choose again. The first level asks you to pick one of three bridges. The second level has three catapults to pick from. The third level has three barrels. During the fourth level you pick one of the three paths that d’Artagnan should take. 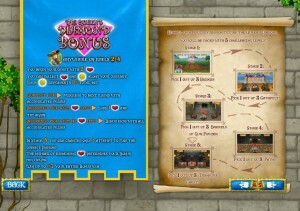 Finally, during the fifth level you choose one of the three treasure chests. It doesn’t matter how many lives you have, you only have one choice to make during the 5th level. 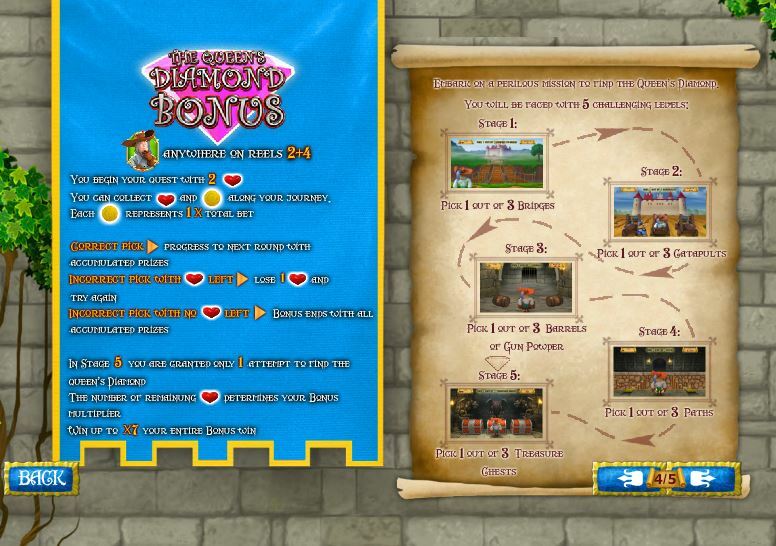 However, those remaining lives will be used as a multiplier for the bonus prize. Up to 7 times the bonus win can be won this way. With the game offering 50 lines, you can choose to activate them all or to save some money, but your odds of getting a win will be lower as well. Each line gets a coin worth up to $100, so you could wager as much as $5,000 on a single spin of the reels. As for the prizes, a 250 coins prize that is obtained through a couple of different symbols will mean up to $25,000 cash. While the features are complex and allow you to have plenty of fun taking advantage of them, the design is even better. 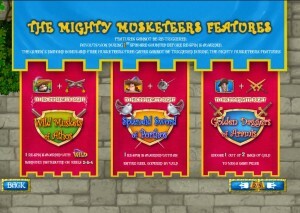 A French castle was placed in the background image, with the reels being in front and themed like they are indeed inspired by the French style of design. The symbols are all themed and they are of excellent quality, with lots of small details built into each one. 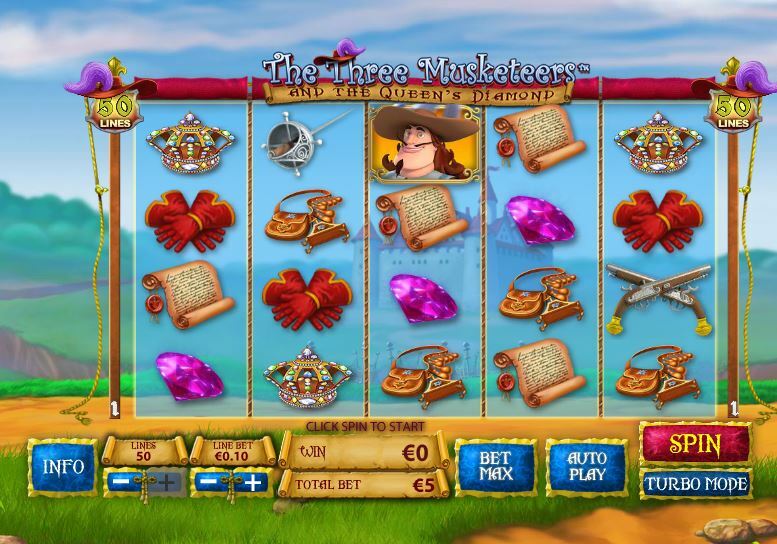 It looks like a slot machine released recently, where developers worked hard to make sure that it’s the best possible Three Musketeers slot machine. 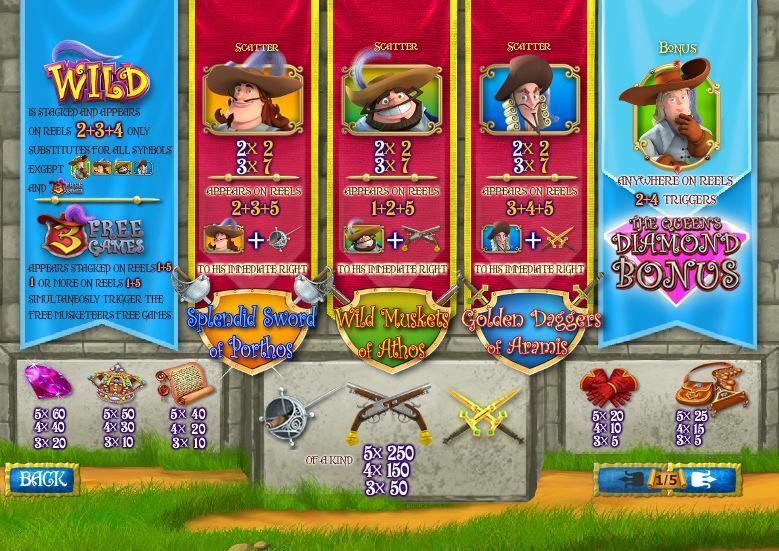 Symbols: Wild Logo (wild), 3 Free Games (scatter), Porthos (scatter, 7x bet), Athos (scatter, 7x bet), Aramis (scatter, 7x bet), d’Artagnan (scatter), Sword (250 coins), Muskets (250 coins), Daggers (250 coins), Diamond (60 coins), Crown (50 coins), Parchment (40 coins), Gloves (20 coins) and Bag (25 coins). It’s definitely worth a shot, even with the low top payouts which are offered, at least when you consider the kind of investment you have to make. It makes up for it with loads of great features though, and with beautiful graphics. 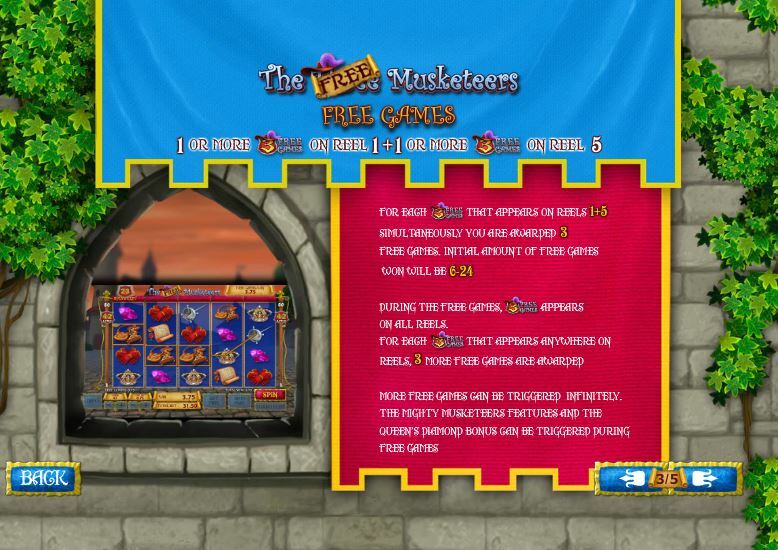 The The Three Musketeers slot machine is offered through the Playtech platform, so if you want to play it for real or just to practice, look out for casinos that use it.